Comfortable vest keeps you cool! 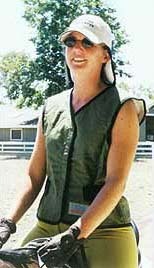 These vest feature a hook and loop opening in the front for quick removal. Heavy elastic adjustable side tabs for freedom of movement. Cut shorter in front for riding activities. Coolmedics Rider apparel is amazing clothing that you soak in regular water for up to two minutes. The cooling effect lasts for at least 4 hours, often up to 8. It is easily re-charged by a brief soaking again and again. Proven to stay at temperatures 20-25 degrees lower than the air surrounding it! As the water evaporates, the garment draws heat away from your own body! Soak, wring, wear, and repeat....what could be simpler?